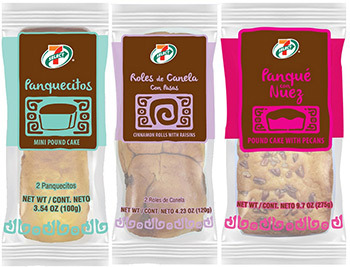 IRVING, Texas -- Convenience retailer 7-Eleven Inc. has expanded its roster of Hispanic packaged bakery items with its new 7-Select private-label sweet bread. For a limited time only, the chain has merged the Panquecitos and Roles de Canela varieties together for a two-for-$3 offer. Both varieties come with two slices and have a suggested retail price of $1.69. The Panque con Nuez, which comes with four slices, has an SRP of $2.59. 7-Eleven offers several products that cater specifically to its Hispanic customer base, one of the company’s largest demographics. These include empanadas, pupusas, chips and salsa, horchata, Hispanic candy and single-origin coffee sourced from Mexico. Because Hispanics are such a dominant 7-Eleven demographic, the convenience-store retailer aims to ensure that these products align with what consumers want to see on shelves and are conveniently and priced competitively, according to Jack Stout, senior vice president of private brands for 7-Eleven. "As an organization, we continuously look for innovative ways to bring products to market that reflect the ethnic diversity that mirrors the communities in which we operate," he said. "Quality and value are always part of the equation. We want to offer products our customers may already be looking for in a grocery store but conveniently and with better value while they fill up with gas or grab coffee." Irving, Texas-based 7-Eleven Inc. operates, franchises or licenses more than 63,000 stores in 18 countries, including 10,900 in North America. The company ranked No. 1 in CSP's 2017 Top 202 list of the largest c-store chains in the United States.